Since my last post, a lot has happened for me in my new writing world. 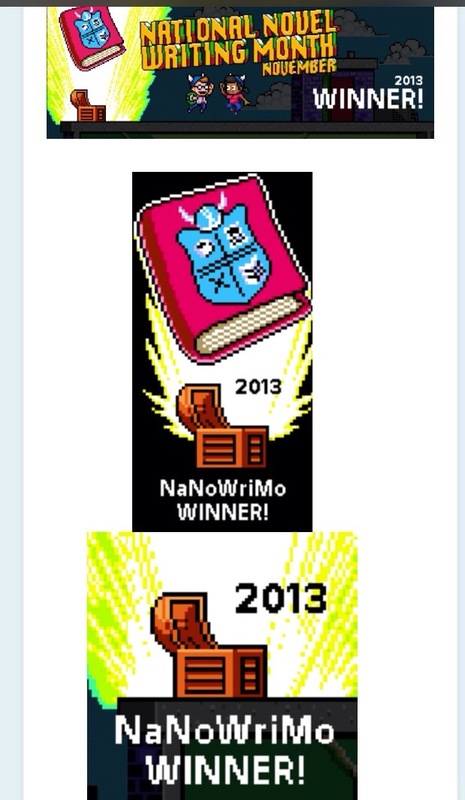 Last fall, I talked myself into attempting NaNoWriMo 2013. For those not familiar with NaNoWriMo, it is a National Novel Writing Month that occurs in November every year. It is a world wide website dedicated to writers complete with chat rooms, support groups, local meet and greets for every locale, moderators,and friends to team up with and cheer on as you write and submit daily word count for a novel. That’s right! You have to write 50,000 words (or more) in one month. Which breaks down to roughly 1667 words a day. It is your own personal challenge to do this. At least it was for me. And the best part was, I did it! I really did! I wrote 54,000 of a novel by the 22nd of November. I have to admit, Thanksgiving Dinner was a huge dangling carrot for me. And HUGE kudos to my hubby for understanding and helping me out around the house with my usual stuff that got put on the back burner. The cooking and cleaning and catering to me he did supported me so much and was a comfort as well. It confirmed his belief in me that I could do this thing, because I sure as heck wasn’t sure. Anyway, I had an outline, I had my characters ready. All that was left was to put a bunch of words together into a story I liked. Now to finish this thing. I am probably looking at another 25,000 worlds to complete the first draft. I know how I want it to end, it’s just getting there. So, these months since last November, I have taken advice from published authors and let the story sit and marinate. That point being, to come back at it refreshed. I crocheted through December, January, and February. I crocheted on through March, April, and May. It was time to stop. It was time to face my WIP and attack it again full force. I have been doing just that this June. I have looked at it turning it this way and that, and even upside down. Not really, but you know what I mean. I’m trying different narratives, going from first person to third, as well as scene change-ups, adding more to the sub-plot,etc. Revising, editing, re-writing, then repeating all of that is what I understand you have to go through to get better. Building up the main character(s) is essential for this novel, as it is for any novel. So character developing has been pretty challenging, as well as working on my descriptions and not losing “my voice”. I won’t go into too much detail as yet about what the book is about other than to say the working title is The Walking Bridge, and that it is a work of fiction with magical realism in it. It is a coming of age story set in the ’60’s of three unlikely young girls of different backgrounds and race who become friends, in spite of what society decrees. Growing up, boys, peer pressure, and racism are all part of the hurdles they have to jump, challenging their friendship. Discovering the town’s secrets surrounding the mysterious tragedies of the forgotten walking bridge becomes an obsession for them, and solidifies their friendship in a way nothing else could. The Break Ridge Falls Walking Bridge, is left to rot, shut-down and unattended for years, and hidden deeply in the dense woods of the decade-closed Break Ridge Falls State Park. Well, I better get back to it then. Just wanted to pop in and say…Hey, I’m still alive! I a SO impressed by what you accomplished during NaNoWriMo! Hooray for husbands and other major supporters! I completely agree with the value of marinating. Fresh eyes see a very different perspective. I know what you mean about being afraid of losing your voice. I can tailor my writing so much, that I edit me right out. NaNo was a surprise to me, Grace. I just thought one day why not? I signed up, I had a story that had been burning in my brain, and I jumped in an made an outline. In post-it notes. In a circle. All over my round mirror. (In the room I was setting up as my writing spot) And then… gulped, as November was fast approaching. You see, I have this “Inner Editor” that used to never leave me alone enough to even finish a chapter, let alone several. I would write a few paragraphs, then erase it, then reword it. My inner editor would have everything completely changed so much, the original thoughts were almost nonexistent. What Nano taught me was to learn how to shut her up. Just write, don’t think. There was time for editing later. It gave me permission to stab her to death so I could write! LOL. It was liberating. Have you thought about NaNo camp for editing? I signed up for July, but the weather is too nice, and my gardening is coming along too well. I’m roughly aiming for Nov. NaNo sounds like fun, in spite of the snipers who are against it. I love your outline method. It sounds like when I was in college: I typed up my notes with a carriage return after each short paragraph. Then, I sat on the floor, cut apart the paragraphs, and rearranged them, paperclipping together the ones that I definitely wanted to keep together, and tossing the ones that I didn’t need. I really like word processors better: the paper doesn’t rip. Remember when we had to retype the whole page when we had one change to make? Ugh! I recall when I had an Inner Editor that wouldn’t let me write. Nothing was good enough to record. It had to be perfect before I could write it. Funny. That wasn’t a problem when I wrote long, frequent letters — you know, the kind with envelopes and commemorative stamps that I chose specifically for the recipient. I never had this problem when I wrote college papers: I took reams of notes, and then weeded them out and put the result into smooth prose. I was the best brainstormer in business meetings — thinking waaaaaay outside of the box. Yes, I write, not think, now. I’m so glad to release my writer’s voice again. I’m glad that you found a way to release yours, too. You might enjoy a certain blog post. I have thought about Nano Camp. But spontaneous visits from grand-kids and children would not make that possible in the summer, I’m afraid. And I wouldn’t give up their visits for anything in the world. Writing in the summer is usually my slower time to write, but after Nano last November, and letting my wip marinate, I found that it has changed up my habits a bit. As for my original writing, I am old fashion in that way. I write everything by hand first, then transcribe it into a doc. or docx. or pdf or whatever. It makes for double the work, especially during Nano, but then, it helps with the inner editor thing too. I did not take classes for writing when I was in college, now I wished I had. In fact, I ‘clepped’ out of English back then. How was I to know after retiring from a pharmacy field that I would pursue writing? I feel the need to take classes just to put my thoughts into “smooth prose”. You have that panache down well. I tried to click on “a certain blog post” and was unable to open it. Everything moves out of the way when my kids visit. Grandkids will be the same. I like handwriting and e-rewriting. Handwriting is more portable since my smallest device is a laptop. I like noticing changes in my penmanship as I write different characters, emotions, and scenes. I like doodling and sketching at times. On the other hand, I like saving drafts of versions as I narrow down possibilities, changing the formatting to make different elements more conspicuous, and using a text-to-speech tool to help me get a different perspective, I like using Vocabgrabber to find excessively-repeated words. Grammar tools sometimes are right about their suggestions. Those are some fantastic suggestions, Grace. Thank you. The Vocabgrabber, especially. Yes, that seems to be the best way, I think, while I’m learning the ins and outs of blogging. Thank you, again.